Do you want to have Landbot under your very own domain? Here you'll find the HTML snippet you need to insert on your site to give a fresh new look to your old and beloved ".com"! Popup. With this option, you will be able to display a modal, covering most of the visible screen with the Landbot. By default, the option is to launch the bot from the widget. However, it is also possible to create a custom button in your site, and let the user press at any time. Once is clicked it will pop up, covering most of the page. Here you can see a demo of how is implemented. Embed. 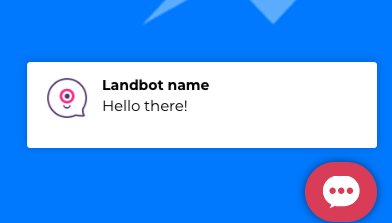 This is the most common option to add Landbot and display it as an iframe, it gives you more flexibility on the location of the bot. It also can be used to create great users experiences if it is communicates with the parent site with the help of our SDK. One good example of this usage is this one. Live chat. This will add a chat bubble at the bottom right of your website that, when clicked, will display a Live Chat. With this functionality you will be able to capture the attention of the users, and bring them to click on the widget easily. You have this function available with Livechat and Pop Up widgets. Don't know how to do this? Click on Let me help you, which will open up the live chat to ask our Customer Support team for help, easy peasy! 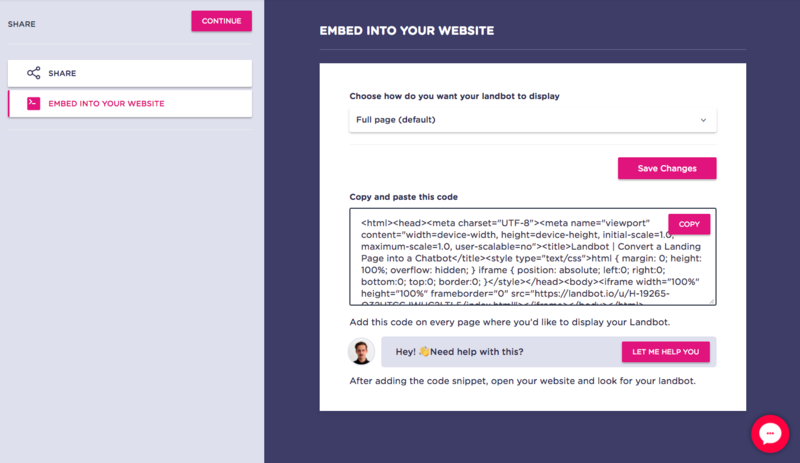 To know more about inserting Landbot's HTML Snippet into one of the hundreds Landing Page providers out there, please take a look at this article.